We have been producing quality infield mixes for baseball and softball for more than forty years. 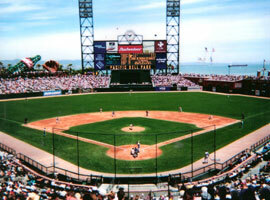 Our Candlestick Park Mix and Pac-Bell Mix are industry standards for all levels of play. 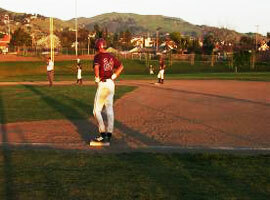 Add PHP Organic Binder or Turface Pro-League and you will have a truly professional grade infield skin. These materials are available year-round in quantities from 1 to 1,000 cubic yards. This material, originally designed in cooperation with the San Francisco Giants and San Francisco Recreation and Parks Department, has been more widely used than any other infield surface in Northern California. From Pony Leagues to college and university fields, Sacramento to Visalia, Santa Cruz to Reno, teams and leagues depend on Candlestick Park Infield Fines to provide a consistent surface with good drainage and proper footing. New raw materials and production equipment have enabled us to update our infield mix in recent years. Pac-Bell Mix is made with a finer grade of volcanic cinder fines and a bit more clay. This creates a much more even, less abrasive playing surface with more cushion and better moisture retention below the surface. 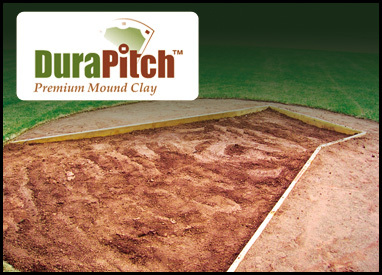 DuraPitch™ Premium Mound Clay is now available in both 50-pound bags & 2,000-pound bulk totes. This professional grade material is pre-moistened and ready to use right out of the bag. DuraPitch™ clay is extremely user-friendly and perfectly suited for both pitching mounds and batter's box applications. For fields in need of more serious repair or renovation; contact one of our representatives for a consultation from TMT Enterprises and/or one of our industry related partners. We have the connections & resources to help you with any size project. ©Copyright, 2014. TMT Enterprises, Inc. All Rights Reserved.